Attend UBC Graduate Student Orientation in late August. Confirm your RES course requirements and course schedule with your supervisor(s). You have until the second week of term to add/drop courses most courses. Begin your courses and attend the IRES Orientation/Welcome Back BBQ during the first Sept! Apply for Awards and Funding starting in late summer and continuing through the fall. In the Spring of the first year in program, you have formed your doctoral supervisory committee and have held your first committee meeting. Is a potential supervisory committee member a non-G+PS Member? If so, you must complete a Recommendation for a Non-G+PS member to serve as part of your supervisory committee. You must complete and submit an RES Supervisory Committee Composition Form to the Graduate Program Manager once your committee is confirmed. An RES Committee Meeting Report form must be submitted to the IRES Graduate Program Manager for each committee meeting held. Your first Committee Meeting Report Form and the Committee Composition form are due to the Graduate Program Manager by the end of May of your first year in program. Complete any outstanding course requirements. Once your supervisory committee is formed, you must complete an RES Committee Meeting Report form for every committee meeting held during your program. Committee Meeting Report Forms are due at the end of May of each year of your program once your supervisory committee is formed. Hold your Comprehensive Exams - this must be completed no later than 30th month in program. The RES Fall Review is a requirement for every second year RES PhD student. The half-hour meeting is held in October of the second year in a student's program. This meeting is attended by the student, their supervisor(s), the RES Graduate Advisor and the Graduate Program Manager. The RES Fall Reveiw Form is completed prior to the meeting by both student and supervisor and is used as the basis of discussion for the meeting. ensure both student and supervisor(s) are clear of the program requirements, expectations and the student is on-track to complete their program (ideally) within 4 years. provide an opportunity for the student to voice any questions or concerns they may have and be able to provide feedback on the program, the courses they have taken, how their last year has been, etc. provide an opportunity for the supervisor(s) to comment on the student's progress in program and ask any questions. Towards the end of the meeting, the supervisor(s) will be asked to leave the meeting to allow for a discussion with only the student, Graduate Advisor and Graduate Program Manager. This time can be used to provide any additional feedback the student may have. Have your Thesis Proposal approved by your supervisory committee. An email confirmation from your supervisor(s) to the Graduate Program Manager is sufficient to confirm that your thesis proposal has been approved by your supervisory committee step - no form to fill out! you must Advance to Candidacy by the end of your 36th month in program, but ideally this is done in your second year in program (within 12-24 months). Hold the RES Fall - Year 3 Review. All third-year PhD students must fill out the required form, together with their supervisors, and submit the completed form to the Graduate Program Manager. While there is no mandatory meeting, students may request to schedule a meeting with the Graduate Advisor and the Graduate Program Manager to discuss their program. Committee Meeting Report(s) due at the end of May (or shortly after a meeting is held). Conduct any fieldwork for your doctoral dissertation. Start planning in detail when these steps will be taken to complete your program on time. Begin the External Examination and Final Oral Defence Process. Under normal circumstances, this process takes about four months to complete. 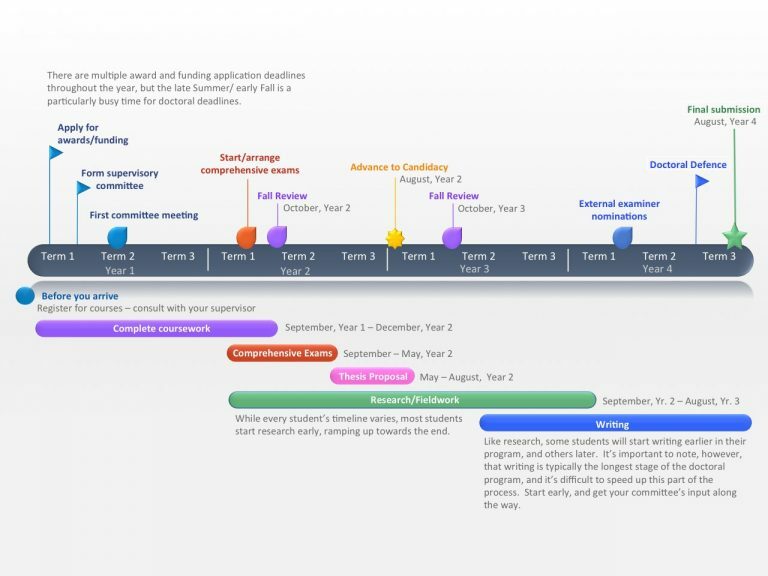 Use the Doctoral Exam Timeline to plan your submission and the Doctoral Exams tools to help you complete all steps. Once you have passed your external examination and have held your final oral defence, you must complete your post-defence submission requirements. Provided you have met all other degree requirements, your program will be closed as of the date on your G+PS thesis receipt (email). Apply to Graduate! This is done via your SCC account and you may apply before/during your external examination process. students are able to have their degrees awarded on any one of four dates in a given year; dates in September, November, February, and May. Once the degree has been awarded by the UBC Senate, a notation will appear on the transcript. However, formal conferral at Congregation ceremonies and official degree parchments will remain available in May and November only. Graduation Ceremonies - held in May and November of each year.